Lamb dressed as Mutton: THE GREAT BRITISH BAKE OFF!!! As you can tell from my title, I am not at all excited about the return of The Great British Bake Off! If you haven't seen it is basically a cooking competition but the contestants are not professionals. This gives it it's charm I think because it makes you believe that you can do it (even though you probably can't!). It's not as drawn out as some of the other cooking programmes and you genuinely do learn from what you see (I now know how to fold cake mixture correctly). The other great thing about the programme is Mary Berry! She is adorable and a great judge. Paul Hollywood is the other judge, he is a bit more scary but actually they compliment each other perfectly. Hosted by Mel and Sue (you can follow Sue on Twitter @sueperkins), who are both hilarious, form the icing on the top. 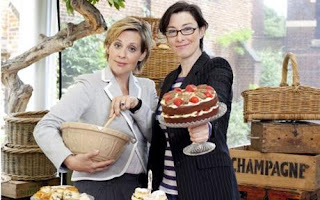 On the basis that I love baking and I love television, you can understand why I love this. 20.00 on BBC, be there! Also on at the moment is Celebrity Masterchef. It started yesterday and I hadn't seen it before but I actually really enjoyed it. Besides I think Emma Kennedy, lovely twitterer and book writer (@EmmaK67), is on it soon, so that is an added bonus. It starts at 18.30 on BBC 2, it's only half an hour and is worth a watch! A new programme called Gates starts tonight on Sky Living. If you have Sky I would really recommend you watch it. It about parents meeting at the school gates, so if you were a child (I think all of you!) or if you have a child (probably not all of you) then I think you will appreciate the humour. Besides it has an awesome cast! Start's at 20.30 tonight. If you don't have Sky, then don't panic because Jack Whitehall has created a new comedy called Bad Education on BBC 3 tonight at 10! It should be really funny and I hope worth a watch. So there is a lot to watch tonight, which is good because I am still mourning the end of the Olympics. Did anyone else get really attached? I did nothing but watch them for whole 2 weeks it was brilliant! I hope you're not going out tonight, there is far to much telly to watch!